Forget Energy Drinks. Leave the Fad Diets in the dust. The greatest wonder to our body is just a spigot away! Water is your body’s natural fuel. Most of us start our mornings with a fresh, hot cup of coffee or tea to warm our bodies after getting out of bed. When we drink water, we tend to prefer it cold, but according to Ayurvedic medicine, we have it all wrong. Regularly drinking very warm water, especially in the morning, can heal our bodies, providing digestive power and reducing metabolic waste that could have built up in our immune system. A very warm cup of water in the morning can help cleanse your body by flushing out toxins. Water and other liquids help break down the food in your stomach and keep the digestive system on track. Warm water will help break down these foods even faster, making them easier for you to digest. Drinking cold water during or after a meal can actually harden the oil in consumed foods and therefore create a fat deposit in the intestine. Adding ice to processed cold water will strip it of natural-containing minerals as these minerals are essential to keeping the digestive tract healthy. 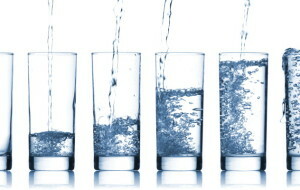 Luckily, you can replace a glass of cold water with a warm one to aid digestion, especially after eating a meal. At one point or another, many of us are plagued by this common stomach problem where we have little to no bowel movement. The strain felt during elimination, accompanied by bloating, is brought on by a lack of water in the body. Drinking very warm water in the morning on an empty stomach can help improve bowel movements and aid constipation while breaking down foods as they smoothly pass through the intestines. Stimulating the bowels will help return your body back to normal functioning. Warm water, considered to be nature’s most powerful home remedy, can help alleviate pain from menstruation to headaches. The heat from warm water is known to have a calming and soothing effect on the abdominal muscles, which can help provide instant relief for cramps and muscle spasms. According to Healthline.com, warm or hot water is usually better for cramps, as hot liquids increase blood flow to the skin and help relax the cramped muscles. If you’re on a diet, chances are you’ve heard drinking a glass of warm water first thing in the morning can help with weight loss. Warm water increases body temperature, which therefore increases the metabolic rate. An increase in metabolic rate allows the body to burn more calories throughout the rate. It can also help the gastrointestinal tract and kidneys to function even better. Physicians recommend drinking warm water in the morning, usually, with a polyphenol-rich lemon immersion, or with a tea shown to decrease free radical activity in the body. Drinking a glass of warm water and a lemon will help break down the adipose tissue, or body fat, in your body, and also control food craving due to lemon’s pectin fiber. The fat deposits in the body are eliminated along with accumulating deposits in the nervous system when you drink a glass of warm water. This flushes out the toxins that are circulating throughout the body and then enhances blood circulation. Making sure the muscles are relaxed will eliminate poor circulation and blood flow. Premature aging is a woman’s worst nightmare, but luckily, this can be prevented by drinking warm water. The presence of toxins in the body can lead to aging faster, but warm water can help cleanse the body from those toxins, while repairing skin cells to increase elasticity. So, next time, ask for a glass of water with lemon… HOLD THE ICE, PLEASE!